The Voluma Connecting System enables you to connect two or more panels in certain angles. This system allows you to create constructive components for trade fair systems, shop fittings, vitrines, exhibitions, furnitures, etc. The various types of connectors make it possible to construct in square, hexagonal or octagonal basic forms, which can also be combined. 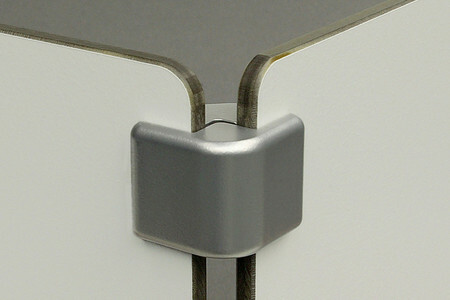 The connectors fix the panels and profiles of 6 mm thickness using a screw thread. Depending on the type of connector you can connect 2, 3 or 4 panels. The connectors hold the panels in fixed angles so that they can take a static function. The amazing stability of the connectors allows you to set up larger constructions, depending on the resistance of the chosen materials. The inside of the Voluma Connector is designed in a certain way, to be able to fit top panels and base plates. You can easily realize bodies and vitrines and even walkable, very stable pedestals.